We are used to the concept of endangered species. We’ve all heard stories of the decline of the Bald Eagle, the Siberian Tiger, Black Rhino, Grey Wolf, Spotted Owl, etc. The list is unfortunately far too long, and not getting any shorter. These animals are classified as endangered by their species. A species is defined as a group of animals, a subdivision of the taxonomic classification of genus that are closely related, physically similar, and can interbreed with one another but not with members of another species. 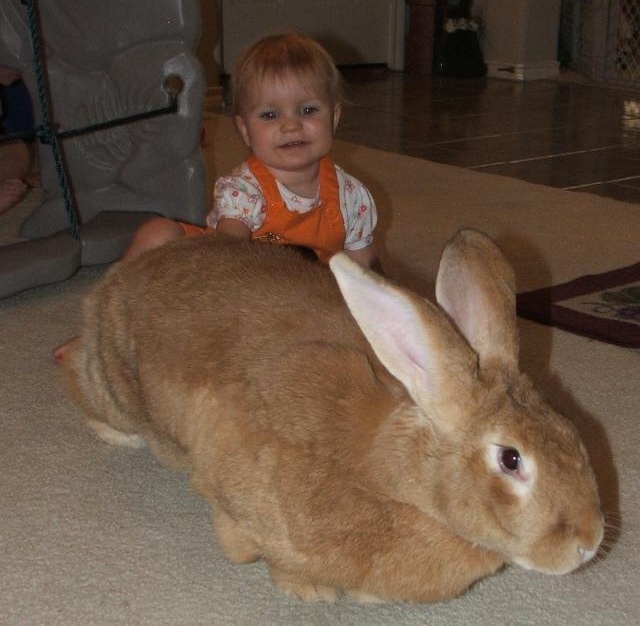 Adult Flemish Giant rabbit. Fortunately hasn't seen the Monty Python Killer rabbit sketch. Don't need them getting any ideas. and the Flemish Giant are obvious, and evidence of the further subdivision contained within breeds. New breeds can be created. New species are discovered. There are no endangered species of domestic animal. Cattle, horses, sheep, pigs and rabbits, as classified by species, number in the tens of millions of individuals. 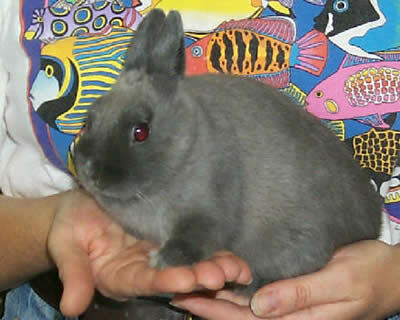 Adult Netherland Dwarf rabbit. Monty Python sketch is autobiographical. What is endangered are certain breeds of domestic animal. It’s easy, especially in a relatively rural environment; to be so used to the presence of domestic species they seem to escape our notice and concern. But each breed contains a treasure chest of genetic diversity. Diversity honed by the environment, geography, by man’s selection and countless other factors, making each breed unique and valuable. Unfortunately, recent trends in agriculture have placed many breeds of livestock, rabbits included, in the same waters as endangered species. Numbers so reduced, that only careful management can prevent their loss. That’s where conservation breeders and organizations such as the American Livestock Breeds Conservancy come in. The ALBC annually publishes a Conservation Priority List, grouping the animals by species, and then further breaking the species down by breed, and then ranking them according to priority. You can see more information here. The list is a working document, and is reviewed annually. If necessary changes can be made in categories, moving breeds from Rare to Threatened, or worse, from Threatened to Critical as data comes in on registrations, births, deaths, etc. A breed in the Critical category can be thought of as being in similar jeopardy as a endangered species, numbers so few that serious action needs to be taken to prevent their loss. It isn’t a perfect document, or an exact science. It isn’t supposed to be. It’s simply a tool to be used in making decisions where to expend resources, and give breeders and idea where to focus their energy. And while no species of domestic animal is likely to wind up on the endangered species list, hopefully we can help to keep certain unique and valuable breeds from sliding further into the category of critically rare and endangered. This article originally appeard in the March-April American Livestock Breeds Conservancy’s newsletter. While I hesitate to say raising rabbits is easy, because raising any livestock – especially rare breeds – comes with specific challenges, there are several advantages to raising rabbits over other species. They are quiet, they do not take up as much room as a herd of cattle, and their manure is like gold for the gardener. They can be prolific, and a few animals can provide a steady supply of healthy, low-fat meat. Rabbits can also provide a fun hobby, activities that can keep children engaged, and learning skills that will last a lifetime. Rabbit shows can be found in nearly every city across the country, and the sky is the limit for the amount of your involvement in the show circuit. If you have decided to get involved with heritage rabbits, choosing which breed to raise is one of the first steps. If you have not already selected a breed, check out the breed profiles pages on the ALBC website (www.alb-usa.org/cpl/wtchlist.html). There are several rabbit breeds, four of which are unique to North America, that are in need of dedicated conservation stewards. Do a little bit of thinking about your climate and your goals before picking a breed. Rabbits will generally prefer colder temperatures to hotter ones. If you live in a climate that has extreme summers, it would be well worth the time to obtain your rabbits from a breeder in the same climate. Find out if the breeder you buy from has any tips for helping their animals acclimate to temperature extremes. If your goal is to provide meat for your family, this will also influence which breed you choose. While all rabbits provide meat, some breeds such as the American or the Silver Fox will supply a greater return on investment in terms of meat when compared to racier type rabbits, such as the Belgian Hare. After selecting your breed, the first challenge is finding stock. As with any rare breed, you probably will not find them down the street or around the corner. Check out the ALBC Breeders Directory to see if there are any breeders close to your area. Also, the American Rabbit Breeders Association (ARBA) has a listing of clubs on their website. Try contacting the club secretary to see if this might lead you to rabbit breeders in your city or state. There is also a listing of shows on the ARBA website; attending a show near you might help in scouting for a particular breed. You may not find your breed of interest at the show, but someone who knows someone who knows someone might put you on the right track. It is important to keep an open mind; a breed you had not considered might be more readily accessible and might work just as well for your project or needs. There is no one “best” breed of rabbit. If you have not raised rabbits before, there is no harm in starting with a more available breed. Start by “getting your feet wet” and then progressing to a rare breed as the opportunity presents itself. After you have selected your breed and found a breeder, make sure you can get pedigreed stock. Most breeders keep good records so this is rarely a problem, but it is best to make sure. Pedigrees are essential when dealing with rare breeds in order to trace bloodlines and inbreeding percentages. If you find you must get rabbits from quite a distance away, there are three possible ways to obtain your stock. The first option (and the most expensive) is to have them shipped. The U.S. Postal Service will not ship rabbits as they do day-old chicks. Unfortunately, when new breeders hear the word “ship” they often have a mental picture of the post-office doing the shipping. Shipping rabbits involves shipping via the airlines. There are only a few airlines that ship rabbits, with Delta Airlines and American Airlines being the most frequently used. Each airline has their own requirements for shipping and these requirements are quite strict. For example, they will not ship if the temperature is above 85 degrees at any point on the trip. If the temperature is below 45 degrees anywhere on the route, a certificate of acclimation signed by the veterinarian must accompany the animal, or the airline will not accept the shipment. They will not accept the animal if temperatures are below 20 degrees, or the lowest temperature on the acclimation certificate, whichever is lower. An approved “sky kennel” (dog kennel) that has been modified to have a non-slip floor and mesh over the vent holes to prevent chewing must be used, and bedding is required. Be prepared to include a couple of day’s worth of food (usually taped in a clear bag to the crate) in the event there is a delay as the airline personnel will need to feed the rabbit. A health certificate current within 10 days of the shipping date is also required. Many breeders do not live near major airports, so it is important to calculate their travel time and costs into the total equation. The cost of the flight itself is based on the weight and dimensions of the kennel, and there may be a limit to how many animals can be placed in it. When everything is said and done, it is not unusual for just the shipping to be in the $300.00 range, without even factoring in the cost of the rabbit. On the plus side, air shipping is no more or less stressful than any of the other methods, and the airlines try to take good care of the animals in their custody. Just do your homework before hand, and know that the airlines are not kidding about any of their requirements. There are a couple of companies that can book the shipment for you, and will handle all the paperwork, but access to a major airport will likely be necessary, and they do charge a fee for their services. The second option for transporting rabbits from one breeder to another is to have someone else who is travelling across the country pick up and bring the rabbits to your farm. It is possible to contact someone who is driving through your area on the way to a major show and arrange transportation of the rabbits with them. Also, a friend or family member going through a certain area may be able to help. You may have heard of “rabbit runs” or “drifts”’ where a driver, or series of drivers, heads from one coast to the other doling out rabbits along the way. While this can be a way to get rabbits you would not have access to otherwise, there are some caveats. First, you may be getting breeding stock sight unseen. Secondly, pedigree information is sometimes lost and although no one intentionally loses this info, it can make getting replacement papers difficult. Finally, the transportation vehicles are often crowded, and the rabbits you get will be exposed to anything and everything the other rabbits might have. (This is also true of rabbit shows.) Be informed of how the rabbits will be handled on the trip, and be sure to practice biosecurity measures before integrating any new breeding stock to your farm. The third method of getting your rabbits is to pick them up yourself. This can often involve a long road trip, an investment of time, and lots of fuel, but the potential to spend some time with a Master Breeder picking their brain about the particular breed can be priceless. Breeders who have been involved with rabbits for decades are an invaluable resource of knowledge and breed history. Take advantage of this whenever possible. You will also have more control over how the animals are handled. Regardless of what transportation method you choose, strike up a good correspondence with the breeder before hand and ask as many questions as possible before starting the process. Callene Rapp is a Senior Keeper at the Sedgwick County Zoo in Wichita, Kansas, where tends to 27 different breeds listed on the ALBC Conservation Priority List. She has a strong background in agriculture, and operates the Rare Hare Barn, in Leon, KS, with her husband Eric where they raise rare breed rabbits, chickens, cattle, sheep and horses. Callene has served as President of the ALBC Board of Directors. Welcome back to Food for Thought Friday. No, not the comfy couch with the remote and a beer within reach. SOFAS is a new acronym that stands for “Solid Fats and Added Sugar”. Basically all the junk that is in all those mega processed grocery store and fast food items. Mark Bittman from the NYTimes on why the new SOFAS is just as bad for you as spending too much time on the sofa. Is Eat Real Food Unthinkable? The herbicide Roundup seemed like a good idea in the beginning. After all, it was designed for no till crop systems, reducing the need for plowing up the soil bed, and exposing precious soil to the elements and erosion. What could go wrong? Over 155 million acres are planted in what are known as Roundup Ready crops, crops that are inherent to our livelihoods such as corn, soybeans, and cotton. These Roundup Ready crops are genetically modified to tolerate having the herbicide sprayed directly onto them, killing everything around them while leaving the crop standing tall. Roundup Ready seeds are patented by Monsanto, the manufacturer of Roundup. In order to be able to use Roundup, farmers have to buy Roundup Ready seeds, resulting in a perfectly closed circle, or rather an endlessly spinning hamster wheel, farmers find it difficult to get off of. 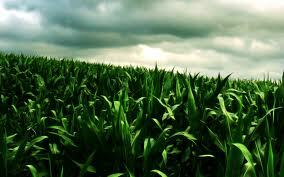 Genetically engineered crops were supposed to be a panacea, promising increased yields and reduced dependence on herbicides. In reality, they have done neither. Weeds that have grown resistant to herbicides, including Roundup, have resulted in greater applications of herbicides being required to achieve the same results, and the promised greater yields haven’t materialized either. A new and potent microscopic pathogen, which is can be linked to Roundup Ready crops or Roundup itself may be directly linked to reproductive failures and abortions in livestock. If it’s in livestock, what livestock eats or what you eat, the odds are pretty good it might also be showing up in a human organism close to you any day. It’s becoming harder and harder to buy the notion that genetically modified organisms, (GMO’s) and all the accoutrement that goes along with making them useful is harmless. And if a respected scientist is writing a letter like this to the Ag Secretary, the issue may be bigger than we can imagine. 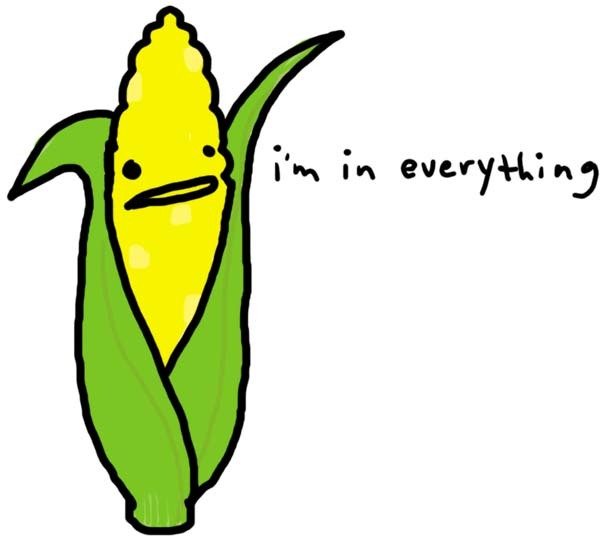 Our agriculture and food system depends on these crops whether it’s a good thing or not. Solutions aren’t going to be easy or cheap and may result in economic change the likes of which we can’t comprehend right now. 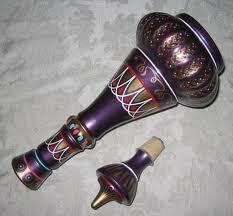 The bottom line is that the genie is well and truly out of the bottle, and it may be impossible to stuff her back in. The Navajo-Churro is an interesting breed with a poignant history. Nearly wiped out not once, but twice by governmental ‘good intentions’ , these sheep are hardy, easy keepers and remarkably easy to get along with. The majority of the rams I’ve worked with have been easy to handle and the ewes are hardy and productive well into their teens. But, one of the most interesting aspects of this breed is the outstanding flavor of the meat. (For more info on why you should practice conservation by consumption look at the blog post here by the same title. ) Navajo-Churro sheep tend to accumulate fat around their organs first, which I would imagine to be a handy survival strategy in a marginal environment. 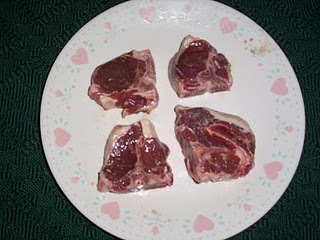 Since there is little fat in the meat itself, even male animals a year and a half old, as this lamb was, don’t get a muttony flavor. We cooked these chops by searing them for about three minutes on each side, one set we seasoned with salt and pepper, the other got nothing at all. The flavor was incredible. I didn’t believe Eric when he said he hadn’t done anything else to them, the taste was herbal, almost perfectly seasoned on it’s own. Of course, a lot of that could have to do with the fact that he (the lamb, not Eric) was finished entirely on grass, but whatever it was, the combination was perfect. The only issue was finding a good wine to pair with it…more experiments necessary in this category! I love cookbooks. I love recipes. I have more cookbooks and recipes than I could realistically ever use in my lifetime, and still one of my favorite places in the world is the cookbook section at Borders. It’s fascinating to see what ingredients different chefs combine to create unique dishes, and it blows me away to think of all the trial and error involved in creating a new recipe. So, when I “tweak” a recipe based on what is at hand or what I have time for, I feel a bit of guilt that I’m not doing proper homage to the process, but sometimes it’s about getting food on the table with a minimum of fuss and mess. And occasionally it works out really well! Sometimes not so much. But we just don’t talk about those. Mario Batali is an award winning chef, owner of multiple restaurants in NYC, L.A. and Vegas. So to even think of “tweaking” one of his recipes is pure hubris, but good rabbit recipes are hard to come by, especially ones that revolve around sausage. So we had to give it a try. Now, the average person’s eyes probably glazed over at deboning the rabbit legs, let alone grinding and mixing your own sausage, and for sure rolled up in your head at the mention of sheep sausage casings. Great for Mario, who has a staff, not so great for the average home cook who not only has to get the kids home from soccer practice, make sure they have clean undies, clean up after the dog, and any one of 6000 other tasks staring us in the face at the end of the day. So we used our fabulous Rare Hare Barn bratwurst sausage instead. (What, you weren’t expecting a plug for a Rare Hare product? ;o) Already made, no deboning or sheep parts involved. 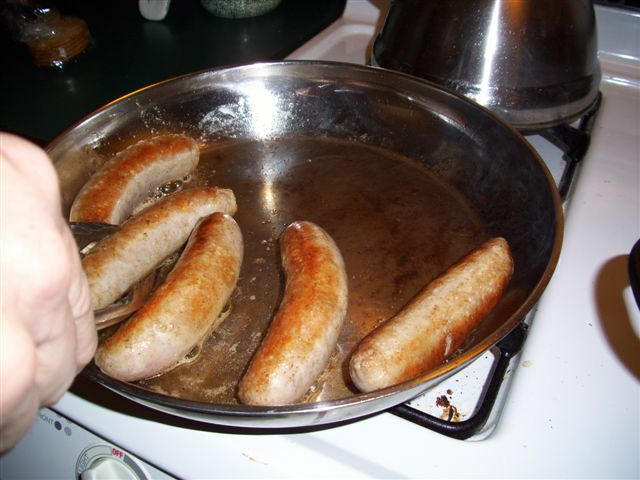 We browned the sausage and cooked the bacon. We used red onions, because that was what I had. And only used one half of a large red onion. I also used 2 tbsp dry white cooking wine, and 2 tbsp red wine vinegar, rather than the larger quantities. The recipe calls for balsamic vinegar, which I was out of, and since according to my handy dandy food encyclopedia balsamic is a wine vinegar, it wasn’t too much of a stretch to try the red wine vinegar. Also, rather than open a whole can of tomato paste for one tablespoon, I used a tablespoon of the ketchup I canned this summer from the garden. 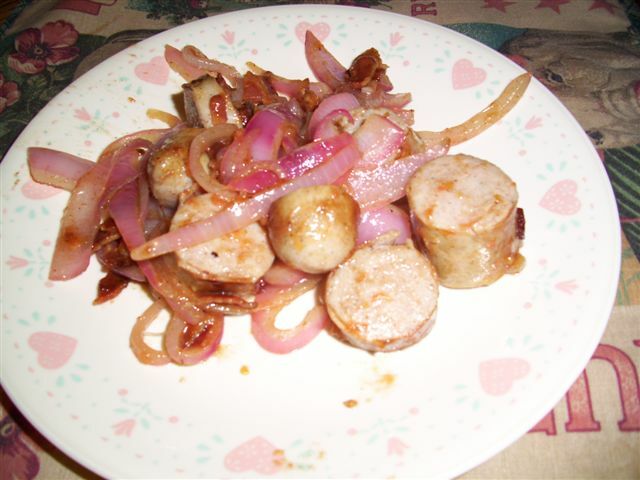 We cooked the onions according to Chef Batali’s recipe and then added the bacon and brats, which had been cut up into small pieces, and then sautéed everything together for a minute or so. It was actually quite good. (I’m sure it would have been 100% better cooked by Chef Batali at his restaurant but he didn’t return my calls. Can’t imagine why!) It was fairly fast, too. The pancetta was likely included to add a little fat and a little seasoning to his rabbit sausage. Just throwing the crisped bacon in with the onions was a little random, but hey, now we have leftover bacon for breakfast tomorrow. Personally, I’d leave that step out. Using the homemade ketchup gave it an interesting flavor which I found tasty, but probably would have gotten me laughed off of Top Chef. It helped make a nice sauce for the onions and next time I’ll add some mushrooms, use white onions and the real balsamic vinegar. So, basically the only thing I retained intact from Chef Batali’s recipe was using rabbit sausage. I doubt he’ll be too worried about my version replacing his anytime soon. Welcome to Food for Thought Friday. This will be a regular series of posts on food, food issues, food in recipes, sourcing food, food in general. So to start off, here is a post from the fantastic Mark Bittman of the NY Times, whose book “How to Cook Everything” should be in every kitchen. It is amazing how much better everything tastes when you prepare it yourself, instead of “cooking” it in the microwave. And when you take into account all the rest of the factors that lead to a profoundly broken food supply, it should give everyone who eats pause. Here’s Mark. What’s in those Chicken Nuggets? Good bye, Year of the Rabbit!